Rebecca J. Hubbard's Growing Strong Together Series is a collection of children's books that assist adults in helping kids cope with difficult life experiences and show the importance of healthy relationships with self and others. 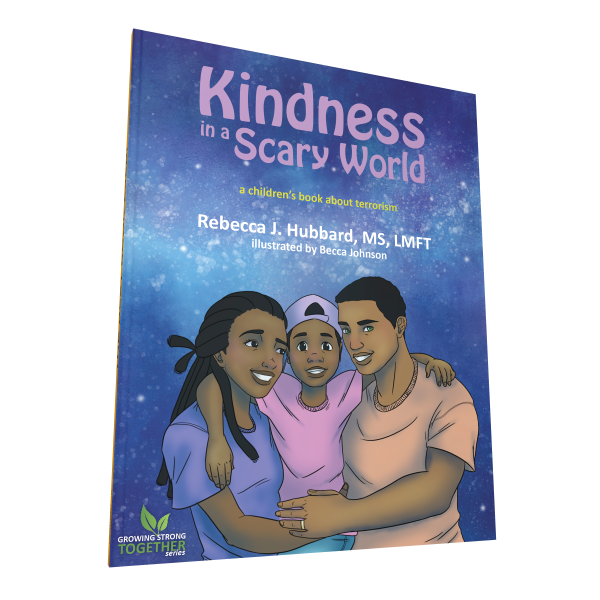 The first book in the series is Kindness in a Scary World. The Growing Strong Together Series (GST) is a group of books that assist adults in helping kids cope with difficult life experiences and show the importance of healthy relationships with self and others. How do you explain senseless mass violence to a child who is just old enough to be aware that the world has become an unpredictable and frightening place? Kindness in a Scary World is a story about a family that watches news coverage of a terrorist attack and the family’s reaction to this event. The child questions why the attack happened and whether their family is safe. The parents honestly answer their child’s many questions about the attack and help reduce their child’s fear by focusing on positive ways the child can contribute to society. All eleven-year old Pip wanted was a best friend. When Pip gets a horse for her birthday she is delighted. She thinks that the horse she names Buck will be her best friend from the moment that they meet. But she finds out that friendship does not come that easily. Her father gently guides her so that Pip can discover for herself how to make Buck a true friend. Pip's new friend, Buck, has a story of his own. After leaving his own herd, to move to Pip's house, he is looking for a relationship that will help him feel safe. He, too, learns that making a friend takes patience and understanding.